A festive service with choir and brass on April 1 at 10 am. Children arriving by 9:55 am may help flower the cross. 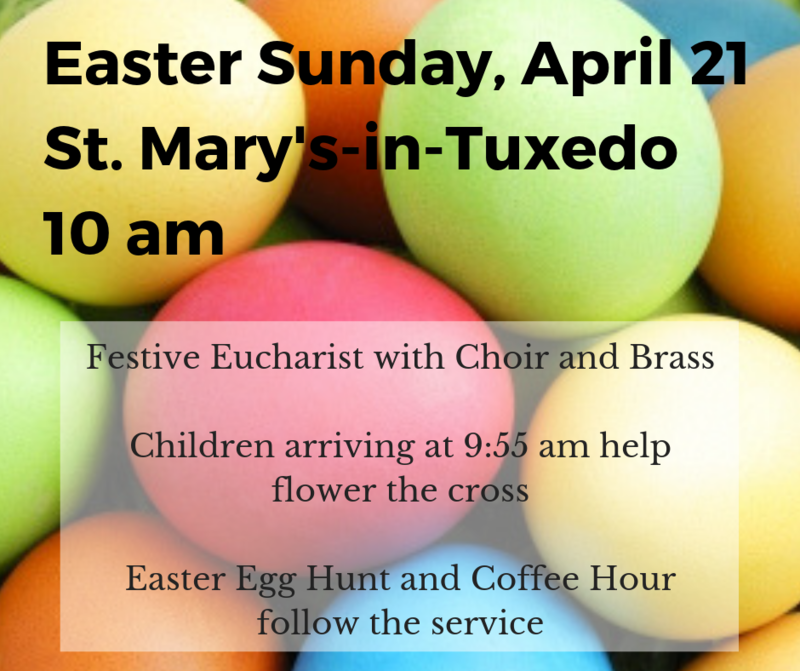 Easter Egg Hunt and Coffee Hour follow the service. Infant/childcare available at 9:50 am. Sign up below to receive an audio link in advance. Listen during the week. Discuss at 9am on Sunday. Jesus spent forty days fasting in the desert during which he endured temptation by Satan. Ash Wednesday marks the beginning of Lent, a forty day liturgical period of prayer and fasting, and will be celebrated at St. Mary's-in-Tuxedo on March 6 with liturgies at 10am (spoken) in the Chapel and 7:30pm (with music) in the Church. Both services will include the imposition of ashes, which echoes the ancient Near Eastern tradition of throwing ashes over one's head to signify repentance before God. Confessions will be heard by Father Robyn by appointment at (845) 351-5122. Thank you to everyone who helped make our annual Mardi Gras celebration last Sunday so much fun -- what a great way to close out the season of Epiphany! Thank you especially to Greg and Patte Stevens, our chefs, who prepared a delicious breakfast; the EYF, Sunday School and Scouts who helped decorate and set up; and everyone who gave so generously to our outreach appeal (for helping people in need locally as well as in Africa). Please visit our Facebook page for more photos of the event and to follow all happenings at St. Mary's. Remember, the Christmas season continues thru Epiphany! Please join us at the Rectory on Saturday, December 29 from 3:00 to 7:00 pm for Fr. Rick's and Pete's Christmas open house. After the rigors of the season, and a long winter's nap, we will be ready to celebrate in grand style. The tree is trimmed and the mantles are decorated; all we need is you! Please park in the church lot and walk up to the house. There are a few parking spaces at the Rectory for those with limited mobility. A recap of last year’s festivities: Our late night snowstorm on Christmas Eve was quite literally the icing on the cake! St. Mary's looked like a giant gingerbread house on Christmas morning, and inside, the decorations and music would make even the biggest Scrooge's heart warm. Please join us for a concert and traditional midnight mass with string quartet and choir in the church, followed by a champaign reception in Bentley Hall. 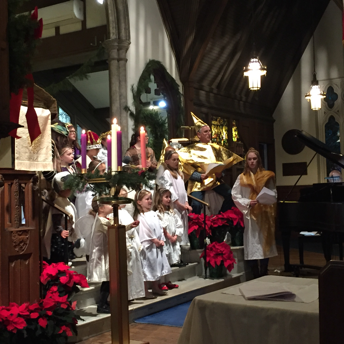 A recap of last year’s festivities: the talented Amaranthus string quartet then joined the choir for a concert and midnight mass, which started with the traditional proclamation and ended with a candlelit Silent Night. It was followed by a festive champagne reception. Please join us for a simple, beautiful service that begins with Christmas carols and includes communion, held in a historic 19th century chapel on the Mortimer Estate. Directions: From the Tuxedo Park gate, turn left on Route 17 and continue north until you see the sign for Arden. Turn right, cross over the thruway, and stay to the left. Continue up the hill, and stay to the right. Pass through the open gate and continue up the hill to the clearing, where you will find the church. A recap of last year’s festivities: the first mass of Christmas 2017 was held at St. John's in Arden with festive carols. Come and join us! The Christmas Pageant will be held on Christmas Eve at the 4pm family service. As always, the entire community is welcome, and children and adults are invited to participate in the pageant. There are speaking and non-speaking parts available. Rehearsals are limited to one on Saturday morning, December 22 (for the speaking parts) and a quick run-through right for everyone before the actual Pageant. So invite friends and relatives in town for Christmas - come one and all. To participate, please just let us know you will come! It promises to be a fun family Christmas experience. For more information and to volunteer, please contact Jenn Creamer. The Pageant is followed by a Milk & Cookies Reception in Bentley Hall. Let’s spice up the Milk & Cookies Reception following the Christmas pageant by featuring our special homemade goodies. As you bake your favorite holiday treats, consider making an extra dozen to share. Drop them off at the church office any weekday before Christmas Eve (we’ll freeze them, if necessary), or at the 10 AM service on Sundays. Please visit our Facebook page for photos of last year’s service. A Thanksgiving service will be celebrated at Saint John’s in Arden at 10 a.m. on Thursday, November 22. If you have never been, it is a magical little church, tucked into the woods on Arden Road in Harriman, we hope you will join us. Thank you to Father Cromey for officiating at this service while Father Rick is away. November 11th marked the 100th anniversary of the armistice that ended World War I. We began our service with a moment of silence to honor those who gave their lives, reflecting on the sacrifices of members of our own community, enshrined in monuments around the church, as well as all those involved in that terrible conflict. Fr Robyn then read a portion of the poem, "For the Fallen," by Robert Laurence Binyon: "They shall grow not old, as we that are left grow old Age shall not weary them, nor the years condemn. At the going down of the sun and in the morning, We will remember them." We then began our worship by singing the national hymn, "God of Our Fathers". Our wonderful Preschool Program celebrated its annual Grandparents Day last Friday with gusto! Please visit our Facebook page for photos and a video of the occasion, and check our the latest newsletter for our Preschool. Wall Street titan turned scientist Alfred Lee Loomis created technology in his Tuxedo Park lab that helped turn the tide of WWII. Join us for a benefit where we celebrate this unique part of our heritage and get a glimpse inside the laboratory and home where history was made! Please click on the images below for more information about the PBS documentary and the original book about these historic events. Many thanks to everyone who attended and supported our bi-annual Progressive Dinner on November 3rd! The theme was "Alfred Lee Loomis: The Lab and the Library." We started at the lab where radar was invented during World War II, currently the home of Sheri Stephenson, then proceeded to various homes throughout the park for dinner, concluding with dessert and entertainment at the Loomis Library, currently the home of Claudia and Carey Turnbull. A special thank you to our co-chairs Jane Garofano and Lili Neuhauser. Please visit our Facebook page for photos of the festivities. All proceeds to benefit the Outreach Ministries of St. Mary's-in-Tuxedo. Please contact Sue Heywood for more information at 845.351.3473. On Sunday, October 14, we welcomed Bishop Mary D. Glasspool for her official visitation, which included the baptism of Laine Peter Ghost and a celebration of our 130th anniversary of dedication. It was a day of great music, preaching, and liturgy. And thank you choir for hosting a festive coffee hour! The visit of one of our bishops is more than symbolic, we all felt a connection to our diocese and the Church. Thank you, Bishop Glasspool, for your ministry among us! Please visit our Facebook page for photos of the occasion as well as a video of Ave Maria sung beautifully by Aileen Mahoney, our soprano section leader. In a longstanding Anglican tradition, pets are always welcome in church, but especially on St. Francis Day! On Sunday, October 7th, we will have a special blessing of the animals at both services, so please bring your furry, feathery, and scaly friends that day. If your pets don't travel well, or you'd like to remember pets who have passed, please bring a photo. During the 10am service, we will celebrate the life and witness of St. Francis with special readings and prayers led by the children of the parish, as well as with seasonal music by the choir. Pets will come up for individual blessings at the chancel steps, and "treats" will be on hand for one and all at coffee hour. Please join us for this beloved tradition, and bring a friend or two! Visit our Facebook page for video and photos of last's year's festivities. In the spirit of St. Francis, our annual animal blessing took place last Sunday during the services. The “peaceable kingdom” was made up of dogs, cats, a lizard, several stuffed animals and photos. Fr Rick offered them all a blessing and a prayer for St Francis to watch over them in the coming year. Additionally, the children of the parish taught us about the life and ministry of St Francis, and offered prayers for animals of all sorts (see video here ). Many thanks to our Sunday School for the children's program, Calvin De Mond and George Thurston for taking videoand photos of the pet blessings, Sandy Taylor for a great coffee hour, and everyone for participating! Many thanks to our Episcopal Youth Fellowship who participated in Tuxedo Family Fun Day last Saturday by hosting a good old fashioned Cake Walk! A good time was had by all!! Please visit our Facebook page for photos of the event. To benefit Orange County Land Trust, St. Mary's-in-Tuxedo Historic Preservation Fund, and the Tuxedo Park Garden Club. This event is Sold Out! Thank you to all who purchased tickets. If you can’t attend the show, don’t worry! You can still get your fashion fix by shopping the beautiful designs after the show. Please stop by Valley Rock Inn on Saturday September 22 from 3:00 pm - 6:00 pm or Sunday September 23 from 11:00 am - 5 pm. Last Saturday's “Pause for a Cause” fashion show luncheon was a great success! Please visit our Facebook page for photos of the event. Thanks to the organizers, especially Sara Cassis, as well as the models, the designers, Lili Neuhauser and all who helped in staging this fête. The new pavilion at Valley Rock Inn provided a fantastic venue for the sold out event! The mother of our Lord is recognized on several feast days throughout the calendar year, but the most important one is August 15th, when the Episcopal church celebrates the Feast of Saint Mary the Virgin. Roman Catholics also honor Mary on this day with the Feast of the Assumption, and the Eastern Orthodox celebrate the Dormition of the Theotokos. On Sunday, August 19th, we will pull out all the stops with a Festival Eucharist at 10am in the Church featuring special music, Marian hymns and a sung mass. We understand that many people are on summer holidays during this time, but encourage you to be present, especially on August 19th at 10am, if possible.